First Park Productions, committed to promoting diversity through theatre, presents "Jacques Brel." This theatre troupe's premiere production is a cabaret-style musical filled with passionate solos, lively ensembles and amazing lyrics of life's issues in moving poetry and soaring melodies. 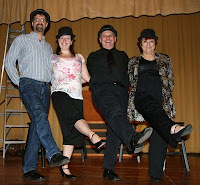 Frank Aronson, Amanda Davis, Matthew Jaquith and Vickie Phillips star. Aronson, a member of Actors' Equity, has performed throughout New England and worked with John C. Reilly, James Whitmore and Len Cariou. Davis has performed in numerous roles in local theatre, including productions at Bay Path College and Exit 7 Players. She holds a Bachelor of Music Education from The Boston Conservatory. Jaquith had his start with roles in "West Side Story" and "Hello, Dolly." He has been a soloist with the Springfield Symphony Chorus and performed in concerts throughout New England. Phillips, an award-winning New York City Cabaret performer with a 2004 OOBR (Off-Off Broadway Review) Award, was nominated by MAC (Manhattan Association of Cabarets). New York Time praised Phillips as "a one-woman room warmer with irresistible charm and vivacity." The musical is directed by Richard Volker, a member of Actors' Equity who has worked in television, radio and theatre, having appeared in countless commercials, as an actor and director, and is a writer of plays and novels. Michael Rheault, musical director, has been active in theatre as a musician and composer for many years. Rheault is the current director of music at First Park Memorial Baptist Church. Choreography is by David Michael Bovat who has earned a national reputation in dance. He has come to be known as the "teachers' teacher." First Park Memorial Baptist Church, 4 Garfield Street, Springfield at 8pm on Fridays, October 1 and 8; Saturdays, October 2 and 9 and Sunday, October 3 and 10 at 3pm. For information and to purchase tickets in advance call 413-654-9111. Tickets will be sold at the door.